The New York retailer launches six biweekly draws of a three Spinning Jewelry stack style rings. Participants can register online and multiply their chances of winning when friends accept their invitation. A Silver Breeze proudly announces the launch of their new Spinning Jewelry contest. One winner with be drawn on the 15th and 30th of every month from April until June. 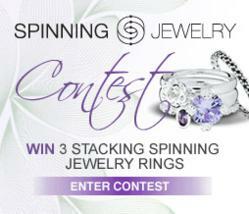 Participants have the chance to win three Spinning Jewelry stack style rings, valued at US$100. Contestants simply need to register and subscribe to the online newsletter, available at the A Silver Breeze online store, to be entered for the six biweekly draws of the stack style rings. No purchase is necessary. All contestants must fill the online form available on A Silver Breeze web site in order to be eligible. Subscribers can then multiply their chances of winning by sharing the contest with friends. The more friends accept their invitation, the more chances they have of winning! The winner’s names will be posted on A Silver Breeze's Facebook page. Be sure to LIKE A Silver Breeze on Facebook in order to see the winner’s names. Winners must claim their prize by email no more than 2 weeks after receiving their winning announcement. For further rules and regulations, please visit the online store. Also, be sure to check out all the new Spinning Jewelry collections in store or online at: http://www.asilverbreeze.com. A Silver Breeze was founded with a philosophy in mind: give women the freedom to be themselves and embrace a sense of style that’s unique to each woman. A Silver Breeze offers women quality sterling silver jewelry that is interchangeable, like the Chamilia, Kameleon, Miss Chamilia, Bijoulee, and the new Spinning Jewelry. Stores are located at the Aviation Mall in Queensbury, New York, at the Wilton Mall in Saratoga, New York, and online at: http://www.asilverbreeze.com. Be sure to browse the online store to see all the available collections. Free shipping is available anywhere in the USA. A Silver Breeze ensures every customer’s shopping experience will be an unforgettable one.